The view from the huts is amazing you are right on the beach front and you can hear the sea! Right on the beach front. Small but perfectly formed for a weekend break. I liked the actual location and the quirkiness of the fisherman’s hut. Parking facilities are good as you can arrive at 1pm and leave your car till the day you check out till 1pm. The staff at the Continental hotel were very helpful and friendly. gluten free breakfast was provided for my husband who is a celiac. The overall experience was really great fun but we had to ask them to clean the room on one occasion. It is a long walk to the hotel for breakfast which have been good to know of in advance. Shower cubicle tiny and a bedside light on both sides of the bed would be a good idea. Stayed in hut 1; lovely, cosy and romantic; you can sit in bed and watch the sun go down. Plus fresh oysters outside the door from The Forge. The most perfect stay - we couldn't have asked for more. Genuinely exceeded our expectations. The location was lovely, the view amazing. The hut very clean and comfortable. Great location. Coffee was poor at breakfast, but the food was good. Food shack on the beach adjacent to the huts provided a great alternative for coffee and breakfast butties and had really friendly staff. Hut was great, although would not be good for anyone over 5'9" due to low ceilings. Milk, t-bags, juice and biscuits provided too. Lock in a great price for Whitstable Fisherman's Huts - rated 9 by recent guests. Located in Whitstable, Whitstable Fisherman's Huts offers accommodation with free WiFi and flat-screen TV. There is a private bathroom with bath or shower and free toiletries in each unit, along with a hair dryer. A buffet breakfast can be enjoyed at the Hotel Continental a short distance away. Canterbury is 6.2 miles from the aparthotel. London Southend Airport is 19.9 miles away. 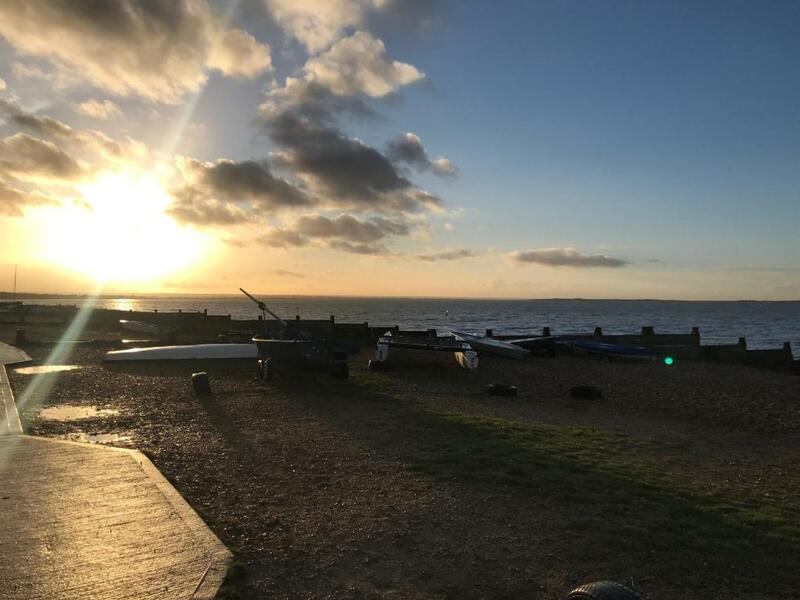 Whitstable Fisherman's Huts has been welcoming Booking.com guests since 8 Jan 2018. When would you like to stay at Whitstable Fisherman's Huts? This hut is a one bedroom sea view hut on the first floor which has a king-sized bed, tea and coffee making facilities, small fridge and an en-suite shower room. There is parking on site. This Hut sleeps up to two adults. This hut offers views of the sea and is spread over two floors. On the ground floor there is a separate sleeping area with 3 single beds, an en-suite shower room, mini fridge and tea and coffee making facilities. On the first floor there is a king-sized bed and another en-suite bathroom. There is parking on site. This Hut sleeps up to 2 adults and 3 children. This hut offers views of the sea and is spread over two floors. There 2 single beds downstairs and a double bed upstairs. The hut has tea and coffee making facilities and has a en-suite shower room downstairs. There is parking on site and the hut sleeps up to 2 adults and 2 children. This hut offers views of the sea and is spread over two floors. There is a a sofa bed downstairs and a double bed upstairs. This hut is a sea-view hut spread over 2 floors with a sofa bed downstairs and a double bed upstairs. It has tea and coffee making facilities and has an en-suite shower room upstairs. There is parking on site and the hut sleeps up to two adults and 2 children. This hut is a sea-view hut spread over two floors. There are two bedrooms, one upstairs and one downstairs. The bathroom is downstairs and has a bath with a shower above. There is tea and coffee making facilities and a small breakfast area. There is parking on site and the hut sleeps up to four adults. It has a small balcony area overlooking the sea. This hut is a non sea-view hut spread over two floors. There are two bedrooms, one upstairs and one downstairs. The shower room is downstairs and there is tea and coffee making facilities and a breakfast area. There is parking on site and the hut sleeps up to four adults. This hut is a sea-view hut spread over three floors. There are two bedrooms, one on the top floor and one on the first floor. The bathroom is also on the first floor and has a shower, and there is a separate toilet on the ground floor. There is tea and coffee making facilities and a small breakfast area on the ground floor. There is parking on site and the hut sleeps up to four adults. It has a balcony area on the first floor overlooking the sea. This sea-view hut is spread over two floors. It has two bedrooms both on the ground floor and a sofa-bed on the first floor in the living area. The bathroom is on the ground floor and has a bath with overhead shower. There is a separate toilet on the ground floor. There is a kitchen and tea and coffee making facilities with a breakfast area on the first floor. There is parking on site and the hut sleeps up to four adults and two children. It has a balcony area on the first floor overlooking the sea. This hut 6 is a sea-view hut spread over two floors with a sofa sofa bed downstairs and a double bed upstairs. It has tea and coffee making facilities and has an en-suite shower room upstairs. There is parking on site and the hut sleeps up to two adults and 2 children. This is a dog friendly hut. This hut is a non sea-view hut spread over two floors with a sofa sofa bed downstairs and a double bed upstairs. It has tea and coffee making facilities and has an en-suite shower room upstairs. This hut is a sea-view hut spread over two floors. There are two single beds downstairs and a double bed upstairs. It has tea and coffee making facilities and has an en-suite shower room upstairs. House rules Whitstable Fisherman's Huts takes special requests - add in the next step! Bankcard Whitstable Fisherman&#39;s Huts accepts these cards and reserves the right to temporarily hold an amount prior to arrival. Whitstable Fisherman's Huts accepts these cards and reserves the right to temporarily hold an amount prior to arrival. Please note that the check-in and key-collection take place at: Hotel Continental, 29 Beach Walk, Whitstable, Kent, CT5 2JT Whitstable. Didn’t have a seaside whereas others did. Didn’t see an option when booking. The accommodation could of been more polished, it was a bit shabby considering the price. Breakfast is between 8.30 and 10.30 half a mile away and check out is at 11. So you either have to go to breakfast early to get back to your room and pack ready for check out at 11, then walk another half a mile or leave your room at about 9.30 to get over to the hotel for breakfast and check out at the same time. We thought the fisherman's huts were overpriced as the lounge area is very small, we also had an infestation of ants! TV did not work on the last day of our break. Postcode of the hotel on our paperwork was incorrect. The room was dusty especially around the fridge area- I had to wash the glasses before we used them. The television didn’t work- couldn’t get any channels. Was 5* expensive for a 4* experience. Particularly if you don’t get a hut with a sea view. The hut is very very far from the hotel that gives you breakfast - at this price they should offer a room service for breakfast. It was a beautiful setting - lovely and romantic. It was quite hot in the room and moving the thermostat didn't appear to alter the temperature.